The family of Marussia driver Jules Bianchi have issued an update on his condition after he suffered severe head injuries at the Japanese Grand Prix. The 25-year-old from France had surgery on Sunday after his car hit a recovery vehicle that was removing another car. The family revealed he suffered a diffuse axonal injury and is regarded as "critical but stable". The FIA, world motorsport's governing body, have asked race director Charlie Whiting for a report on the crash. What is diffuse axonal injury? "Jules remains in the Intensive Care Unit of the Mie General Medical Centre in Yokkaichi. He has suffered a diffuse axonal injury [when the head is rapidly accelerated or decelerated] and is in a critical but stable condition," the family said. "The medical professionals at the hospital are providing the very best treatment and care and we are grateful for everything they have done for Jules since his accident." The statement added: "This is a very difficult time for our family, but the messages of support and affection for Jules from all over the world have been a source of great comfort to us. We would like to express our sincere appreciation." Former F1 doctor Gary Hartstein says it is difficult for medical experts to determine the extent of the diffuse axonal injury sustained by Bianchi. "We can't really can't say anything about prognosis right now. This has to be given time," he told BBC Radio 5 live. "Diffuse axonal injury means that the patient is not doing well, but the scan of the brain often looks normal. Let's wait for him to get out of intensive care, get the vital signs stable and then see." 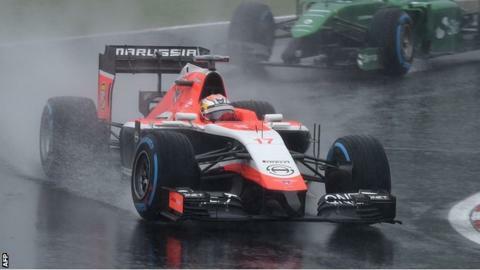 Bianchi, who made his F1 debut with Marussia in 2013 and is also a member of the Ferrari young driver academy, lost control close to where Sauber driver Adrian Sutil had spun and hit the tyre barrier. As a recovery vehicle was lifting Sutil's car, Bianchi travelled across the run-off area and hit the back of the vehicle. The FIA have ordered a thorough review of the events that led up to the incident. "This report is still under elaboration as it concerns the cross-checking of a number of different sources of information," the FIA told BBC Sport. "It will aim to be as complete and detailed as possible in order to understand exactly the accident which occurred." The wet conditions were worsening at the time of the crash and Williams driver Felipe Massa said he had been "screaming" his concerns about the amount of water on the track. The Japanese Grand Prix had been under threat because of a typhoon predicted to cause disruption at Suzuka, and torrential rain did affect Sunday's race. It was red-flagged after only two laps because of the weather, before resuming about 20 minutes later under the safety car.